Kids who learn about the dangers of drug use early and often are much less likely to develop addiction than those who do not receive these critical messages at home. However, research shows these conversations tend not to include the topic of medicine abuse. Parents and other caregivers have an incredibly important role to play. We can all take action by having frequent conversations with the teens and young adults in our lives about the dangers of medicine abuse. But we know these conversations are not always easy. In fact, they can be really challenging. You discover that your daughter has been taking a depressant not prescribed to her. When you ask her about it she says it’s because she works herself into a breathtaking frenzy whenever she’s stressed. Upon further questioning, she reveals the pills are from your medicine cabinet, and she calls you out for occasionally taking a pill or two from an old prescription to calm your own nerves. What would you say? This is uncharted territory for most parents and caregivers. While you don’t have to tell your child every detail, be open with her. Admit that you have misused prescription medicine, that it was wrong and you regret it. And let her know that you don’t want her making the same mistakes. It’s important to emphasize that this is about her, not about you. Try to understand why she felt she needed the prescription medicine and how you can help her manage her stress in a healthier way, like listening to music, exercise or reaching out to a friend. If she pushes the hypocrisy point, cite a bit of science. It takes about 25 years for the brain to fully develop. Explain that her brain is vulnerable to unhealthy influences like the abuse of Rx drugs and OTC cough medicine, street drugs and alcohol. If your daughter is feeling anxious and overly stressed, a consultation with a child and adolescent psychiatrist or qualified mental health professional may be helpful. 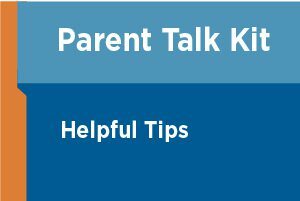 Download our Parent Talk Kit to learn how to help end medicine abuse and how to keep the teenagers and young adults in your life healthy and drug-free.